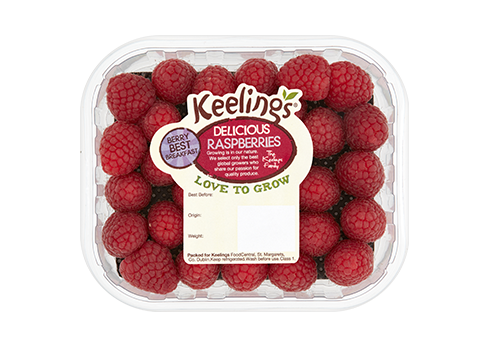 Keelings Retail Division uses state-of-the-art facilities to supply the fresh produce needs of the Irish retail sector. Our aim is to consistently deliver best-in-class excellence in Fresh Fruits, Salads, Vegetables, Flowers and Plants on a daily basis. We constantly work with our suppliers and retail partners, striving to bring the very best in terms of quality and value in order to meet the high demands of today’s consumers. Furthermore, as we blend traditional experience with the most modern production techniques to introduce new varieties with improved presentation and flavour, we need our clients’ confidence to innovate. In response to extensive market research and consumer demand, we launched our Keelings Brand. Traditionally, the Irish retail market for fruit was dominated by unbranded or store’s own-label brands.We proudly put our name to our produce by launching our Keelings branded Strawberries into major Irish multiples in May 2010. Consumer demand was instantly positive; sales soared and we quickly moved to market our entire fresh berry range under the brand. More recently, we have added peppers and salads to the range and further brand extensions are to be expected. We believe our investment in the brand allows us to deliver significant added value to the category. You can expect to taste lots more of the passion from Keelings! Fruit: Strawberries, Raspberries, Blueberries, Blackberries, Mixed Berry Packs, Irish Eating Apples, Irish Bramley Apples and Cherries. The Keelings Brand is continually growing and new lines are regularly being added. Keelings supplies the fresh produce needs of the retail business in Ireland. Whether it is fruit, salad, vegetables or flowers and plants, we deliver excellence in growing, sourcing, packing, distribution, sales and market development. We work with our suppliers to constantly develop fresh produce to the highest levels – meeting the criteria of best value, best quality, best appearance, best taste and best flavour. These strong relationships allow us to work with our suppliers to develop new varieties of fresh produce and new advanced production techniques. Our global reach guarantees us the flexibility to offer clients and suppliers service solutions across the world. Keelings have purpose-built facilities to ripen produce to meet customers’ specific requirements. We ripen over 3 million bananas each week as well as other lines, such as peaches, pears, plums and avocados. Our dedicated, fully-trained technical and quality team ensures that product quality, safety and legality is maintained and all customer-specific requirements are met, both at our own Keelings sites and at source locations. Keelings packhouses have BRC Grade A certification.